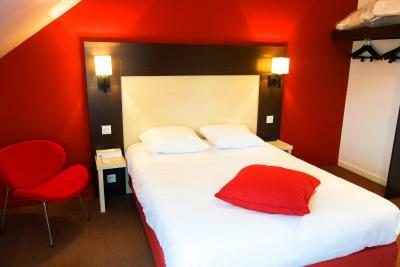 Lock in a great price for Kyriad Rouen-Nord ~ Mont-St-Aignan – rated 8 by recent guests! 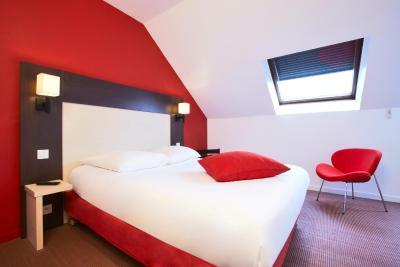 Everything was up to our expectation, so we would recommend, especially to those who are driving, as we felt it was much better than staying in Rouen central. We arrived quite late and the staff were very accommodating, letting us swap rooms to get the perfect bed ratios and quickly setting up a table for us in the restaurant. Lovely to look at, convenient parking and made us feel very welcome on our first night in France. Convenient stop over from England en route to Spain. Restraunt is excellent, both for breakfast and dinner. the wine is very drinkable. 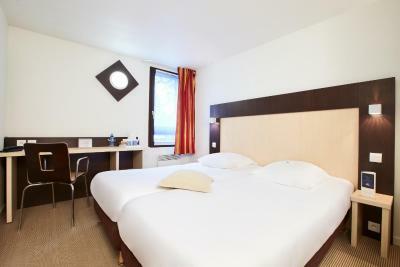 Beds are very comfortable room and facilities are more than adequate. Good location if your are passing through there is a large Carrefour next door. 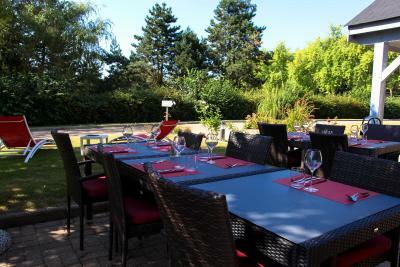 The location was ideal for our purposes - in fact it is the only hotel in Mont-St-Aignan. 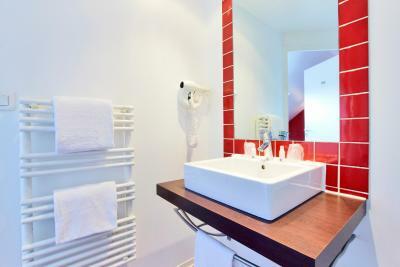 The small double room and even smaller bathroom were clean and, although sparsely furnished (one small chair and a comfortable bed) adequate for a short stay. The menu was small but varied and the food was well presented and enjoyable. The arrival is simple, room was clean and comfortable. Breakfast is very good. Very conveniently placed for the autoroute. 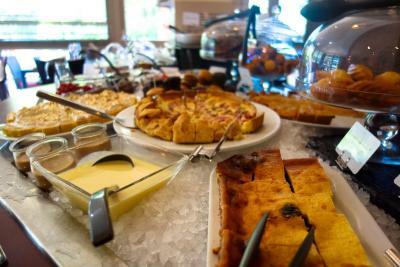 The rooms were clean and fresh and an excellent breakfast in th morning. The receptionist, who was also looking after the breakfast room the morning that we were there, was very polite and helpful. Unfortunately we arrived on a Sunday and the restaurant wasn't open. We would have liked to eat at the hotel but hopefully will get the opportunity to do so when we stay again. Kyriad Rouen-Nord is located 3.1 mi from the center and Rouen Cathedral in the village of Mont-St-Aignan. 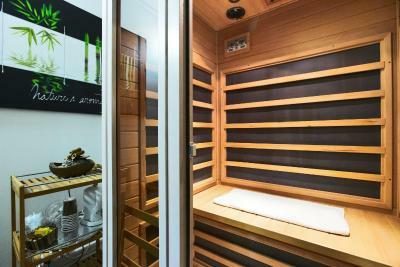 It offers free internet and guests have free access to the hotel's sauna. 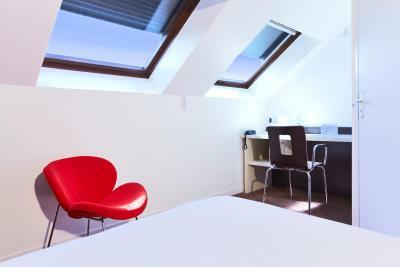 The rooms feature a TV, a telephone and facilities for making hot drinks. 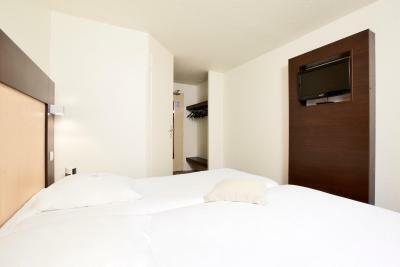 They each have an private bathroom and bathrobes for the sauna are available upon request. 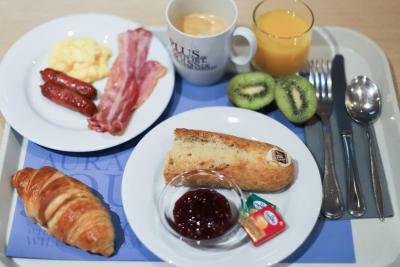 A buffet breakfast is served daily at the Kyriad Rouen-Nord Mont-St-Aignan. 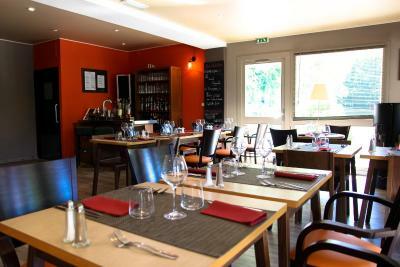 The restaurant is open for lunch and dinner and proposes innovative cuisine. 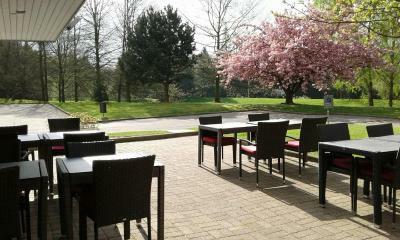 Mont-St-Aignan golf course is 0.6 mi from the hotel. Free public parking is possible on site. 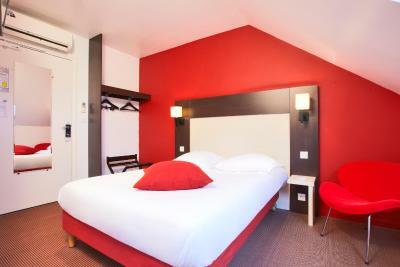 When would you like to stay at Kyriad Rouen-Nord ~ Mont-St-Aignan? 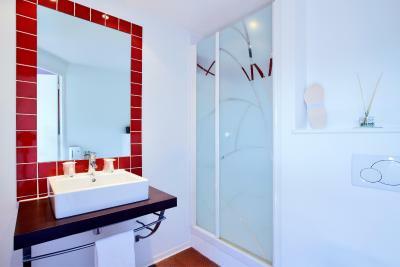 Free internet access and facilities for making hot drinks are provided in this room with attached bathroom. House Rules Kyriad Rouen-Nord ~ Mont-St-Aignan takes special requests – add in the next step! Kyriad Rouen-Nord ~ Mont-St-Aignan accepts these cards and reserves the right to temporarily hold an amount prior to arrival. Guests must arrive at the hotel prior to 23:00. Your room cannot be guaranteed after 23:00. If you cannot change your time of arrival, please contact the hotel before 23:00 local time. Contact details can be found on the booking confirmation. Please note that the restaurant is open Monday to Thursday from 19:00 to 22:00 and on Friday from 19:00 to 21:30. Please note that for hygiene reasons pets are not allowed in the restaurant or breakfast room. - from 07:00 to 11:00 on Saturday and Sunday. Directions to hotel were poor. Dogs not allowed in restaurant and couldn’t eat in bar area with pet so had to take pizzas (only food available and run out of one choice of pizza) to room to eat. Got the impression that the manageress was not a dog lover and felt uncomfortable about this. We arrived after a long day on the road and asked for two cups of tea. Two cups, some hot water and ONE tea bag were produced. We were told we had to share the tea bag as it is company policy not to provide two. (there was also only one in the double room). The small bar was closed but Reception produced drinks when asked. We asked if we could use the sauna but were told that we had to give at least 45 minutes notice as it was turned off. 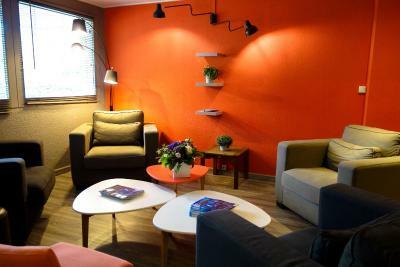 The only place to sit and relax is a small alcove in the Reception area with three chairs and a small table which meant that even if only one person was there, there was not room for anyone else. 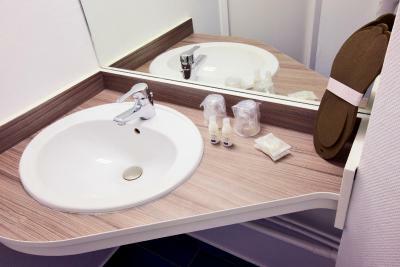 This hotel is adequate for those wanting bed and breakfast but not really suitable for groups and families owing to the lack of space to relax and enjoy your stay. It was a shame the restaurant was closed for the evening, as it means we had to go out again to eat. Nothing to mention. This was our first stay at this hotel but we will certainly do so again. Sadly no restaurant at week end for evening meals, but two or three within 10 minutes walk or few minutes drive. Asked for a ground floor room and was given a room for disabled! Small, dark. Dirty shower area, no bath. Awful. Was glad to leave the following morning. Not too impressed with the toilet flush. Fresh orange juice at breakfast always picks me up first thing. Good location, wonderful staff, restaurant food great but slightly limited on choice.